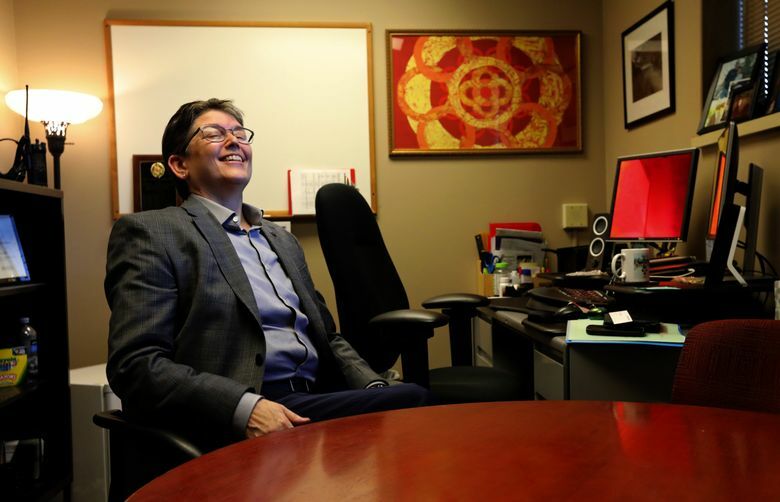 King County’s Sheriff-elect Mitzi Johanknecht has risen through the ranks over three decades and is now preparing to lead the 1,000-person law-enforcement agency. 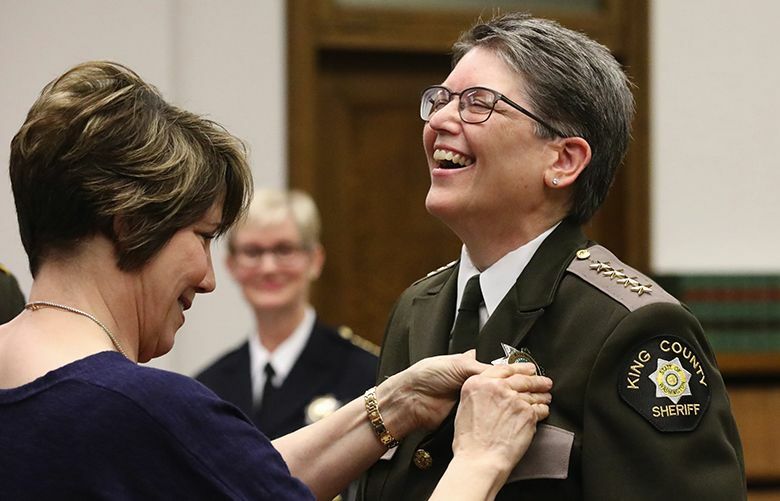 When King County Sheriff-elect Mitzi Johanknecht takes the oath of office Tuesday, she expects her new commanders to also swear to uphold the Constitution and enforce the laws of Washington. It will be a symbolic gesture to denote the kind of unity and healing Johanknecht wants to bring to a Sheriff’s Office bruised by sexual-misconduct allegations leveled at Sheriff John Urquhart and scarred by what several deputies say has become a toxic work environment. “The night of the election and in the days after that, as things became more clear I would be sheriff-elect, there was a deep sigh in the organization,” Johanknecht said of her November upset in unseating Urquhart, who was first elected sheriff in 2012. • Supports Initiative 940, a proposed statewide measure that requires specific mental-health training, de-escalation training and rendering first aid. It also removes the word malice from applicable state law and defines good faith in order to reform police prosecutions when wrongdoing occurs. • Opposes safe-consumption sites, saying that all deputies should be equipped with overdose medication and more “on-time” treatment be available to those in need or crisis. Concerned that the law-enforcement role around consumption sites is not clear and worries persons using the sites may be victimized before entering and upon leaving the sites. 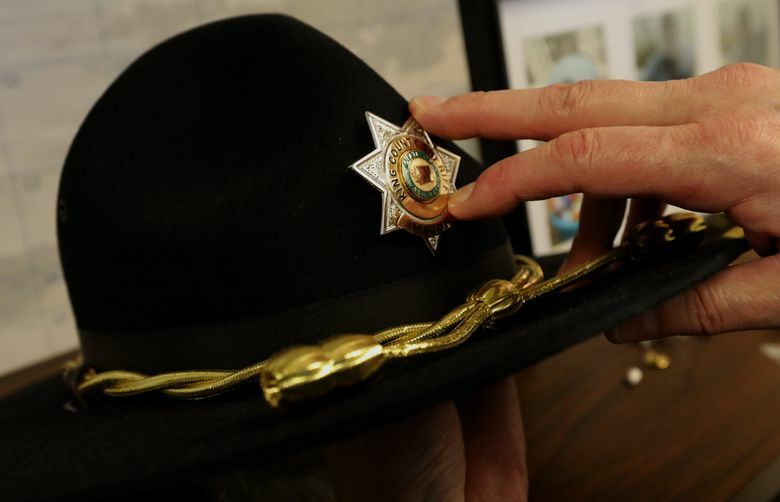 • Supports equipping deputies with body cameras, while acknowledging that work with the ACLU and community is important to successful programming. • Wants more in-service scenario-based training for deputies in dealing with people in crisis. Plans to equip patrol deputies with more less-than-lethal tools like “beanbag” rounds in an effort to reduce lethal-force situations. • Opposes having deputies ask about immigration status because it has a chilling effect on crime reporting. In the weeks since the election, Johanknecht — whom Urquhart promoted to major in 2015 — has been juggling her responsibilities as commander of Precinct 4 in Burien with assembling a transition team and command staff, meeting with other elected officials and creating a blueprint for her first six months in office so the rest of her four-year term can be spent delivering those changes. “It’s truly a process of learning what I don’t know and it’s been a lot of fun,” said Johanknecht, who will mark 33 years with the Sheriff’s Office on Monday. She’s embarked on a crash course of what it means to run a 1,000-person law-enforcement agency that provides police services to a unique mix of urban and rural communities without the benefit of Urquhart’s aid. Urquhart, who has vehemently denied allegations of sexual impropriety, has refused to speak to Johanknecht. He also declined to be interviewed for this story. “The sheriff is not speaking to me just yet,” Johanknecht, 58, said in an interview last month. Her phone calls and emails to Urquhart have gone unanswered “and I was told I could stop doing that,” Johanknecht said of her efforts to reach out to him. So instead, she’s met with Pierce County Sheriff Paul Pastor, Snohomish County Sheriff Ty Trenary and Sue Rahr, former King County sheriff. Johanknecht (pronounced “Joe Hank Nick”) has a reputation as a hardworking straight arrow, said Rahr, the executive director of the Washington State Criminal Justice Training Commission who served as King County’s sheriff from 2005 to 2012. In addition to policing unincorporated King County, the Sheriff’s Office has contracts to provide police services to 10 cities, two towns, the Muckleshoot Indian Tribe, the King County International Airport, King County Metro Transit and Sound Transit — which means working with a variety of mayors, councils, commissioners and other government officials. Rahr, who has met with Johanknecht and offered herself as a sounding board, said she agrees with the sheriff-elect’s goal of healing rifts and uniting the rank-and-file. During Urquhart’s tenure, he was seen as inserting himself into the internal-investigation process and actively hunting for policy violations as a way to retaliate against subordinates, said Johanknecht and other deputies who spoke on condition of anonymity. Three people who worked on Johanknecht’s campaign “suddenly had internal complaints filed against them for policy violations,” said the sheriff-elect. Two longtime sheriff’s deputies who know Johanknecht only by reputation echoed many of the sheriff-elect’s concerns about the way the department has been run under Urquhart. Both spoke on the condition of anonymity because they feared possible job reprisals. “We’ve been walking around for years on eggshells,” said one of the deputies. During the campaign, Urquhart disputed such attacks, saying they stemmed from tough new standards he put in place that led him to fire 22 deputies and hold commanders more accountable. Johanknecht has already decided on her command staff, with more changes planned as she fills positions that open up with the shifts in personnel. Capt. Scott Somers, Johanknecht’s second-in-command at the Burien precinct, will be promoted to chief deputy sheriff. Maj. Jerrell Wills, commander of Precinct 2 in northeast King County, is to become Johanknecht’s criminal-investigations chief; and Lisa Mulligan, now the chief of police in SeaTac, one of the sheriff’s contract cities, will take over as chief of patrol operations. Patty Cole-Tindall, a longtime county employee with extensive experience in labor relations, will remain in her position as chief of the sheriff’s technical-services division, overseeing a wide range of functions from the 911 communications center to payroll and information technology. “The plan is right after taking the oath, I’m asking all my appointees to step up and take the oath with me, all together,” Johanknecht said. She is also planning to establish a community-outreach unit, staffed by a media-relations officer and a full-time recruiter that will grow over time. She plans to convene a media roundtable to discuss ways to better publicize the work of the Sheriff’s Office. Johanknecht intends to conduct a needs assessment for contract cities and unincorporated communities; develop a strategic plan; step up the number of community-advisory councils; and create a career-development program for the department’s commissioned and civilian staff. She also wants to move the internal-investigations unit out of the “sheriff’s suite” at the King County Courthouse in downtown Seattle to another county building to provide a greater buffer between herself and the people responsible for investigating policy violations and misconduct allegations against sheriff’s employees. “The policies and procedures of the King County Sheriff’s Office … apply to me as sheriff. The community can count on that. Everything everyone else follows in the Sheriff’s Office, I will follow,” Johanknecht said. Johanknecht — whose childhood home is a mile east of Precinct 4 — lives in West Seattle with her wife, Maureen Warren. The couple were set up by friends in 2001. Along with Warren’s ex-husband, they raised their daughter Sydney, now 34 and living in New York City. During traffic stops, she’s experienced firsthand how she as an officer can make drivers of color fearful to roll down their windows. “It’s gut-wrenching to go through when you understand there’s true fear from the person inside the car,” Johanknecht said. The middle of five siblings, Johanknecht graduated from Bainbridge High School in 1977 and later, from the University of Washington, where she played basketball and studied education. Though sports have remained a lifelong passion, teaching didn’t hold her interest. She was 1½ years out of school and working with her dad, then the property manager at the Space Needle, when a friend invited Johanknecht on a ride-along. In July 1984, Johanknecht spent a night shift driving around the Maple Valley area with then-Deputy Sue Peters. Six months later, Johanknecht began classes at the police academy. 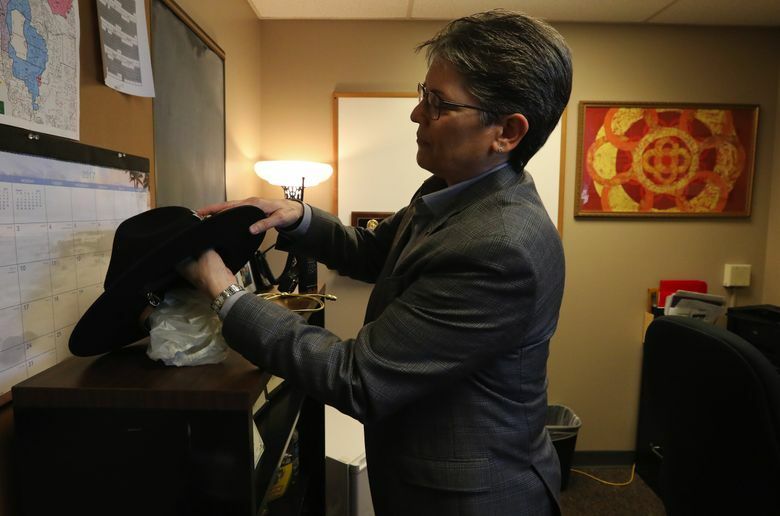 Peters, who worked for 20 years as a homicide detective in the sheriff’s major-crimes unit before retiring in 2011, said she’s watched as Johanknecht has risen through the ranks.